“Cocoa powder, sugar and salt – but just a pinch of salt, otherwise it’s too salty,” the nine-year-old said, listing off ingredients for the homemade hot chocolate that’s helped her raise $3,000 for children and refugees in war-torn countries. 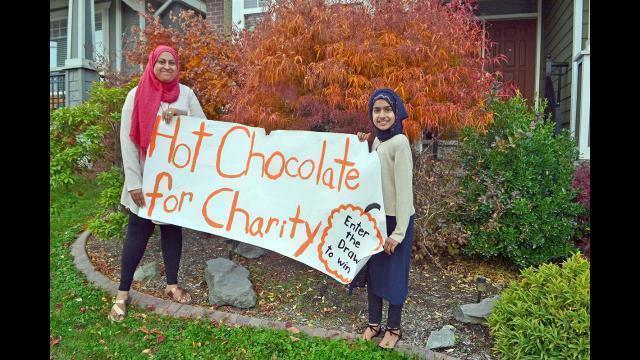 Ziyana, in Grade 4 at Southridge School, began her tradition of setting up a hot chocolate stand t the end of her South Surrey driveway every Oct. 31 three years ago. Her mom, Zehra, recalls Ziyana initially asked to host a summer lemonade stand because she wanted “to raise money for orphans,” but life got busy and the idea never came to fruition. But Ziyana didn’t give up, and the idea for a hot chocolate stand during prime trick-or-treating hours was born. “I kept talking about lemonade stand, lemonade stand, lemonade stand,” Ziyana told Peace Arch News last week. Days ahead of time, Ziyana goes with her dad to deliver flyers around the neighbourhood to promote her fundraiser, then prepares a banner and other decorations for the stand itself. On the big day, she brews the drink, dons a costume and, with the help of her younger siblings Armaan and Aila, and under mom’s supervision, offers the sweet concoction at 25 cents per cup for trick-or-treaters, and by-donation for adults. When she started out, Ziyana set a goal to raise $1,000 for Child Aid International, a Canadian charity focused on helping orphans. The first year, her effort raised $524 – including $100 that was donated by a classmate’s parent following a school presentation Ziyana did about her fundraising project. Last year, with no time for advance promotion, she collected $200. This year, not only were 250 flyers distributed ahead of time, but the availability of the tasty beverage, along with details of where donations would go – and a link to the charity itself – was posted to Facebook. A prize draw was also added, to sweeten the pot. The result was better than expected – just over $2,000. “At the stand alone, cash that came in… was $326,” Zehra told PAN the day after Halloween. “And then she got a whole bunch of donations because we posted on Facebook. And, she got a matching donor. The donations, she said, will help build a home in Syria for five siblings whose parents were killed in war. It should be no surprise that Ziyana is no stranger to helping. In kindergarten, she donated her hair to Wigs for Kids, a charity that aims to improve the quality of life for kids dealing with cancer. Zehra said her family also participates in “all sorts” of charitable work with their mosque, the Az-Zahraa Islamic Center in Richmond. “I’m just sticking to this one,” she said.